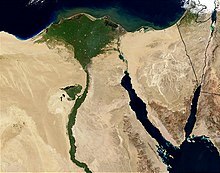 The Nile Delta (Arabic: دلتا النيل‎) is the delta formed in Northern Egypt (Lower Egypt) where the Nile River spreads out and drains into the Mediterranean Sea. It is one of the world's largest river deltas—from Alexandria in the west to Port Said in the east, it covers some 240 km of Mediterranean coastline—and is a rich agricultural region. From north to south the delta is approximately 160 km in length. The Delta begins slightly down-river from Cairo. Dams farther upstream on the Nile have stopped further addition of the silt that built the delta in past centuries. Because of this, the delta is shrinking. This page was last changed on 2 December 2016, at 23:37.